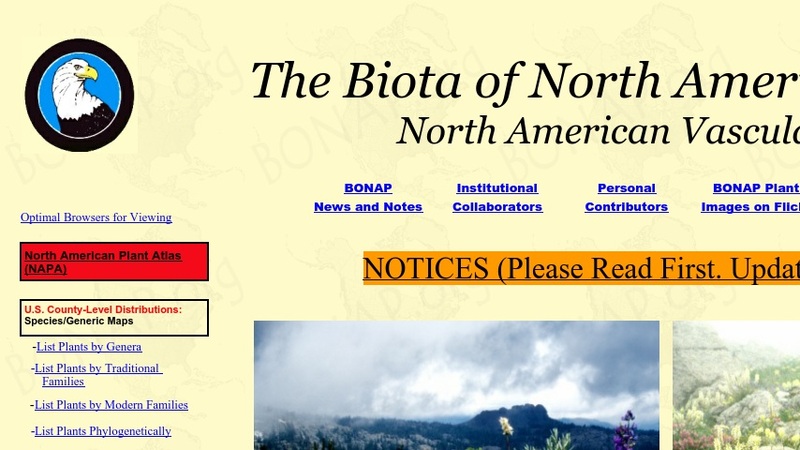 The goal of the Biota of North America Program (BONAP) is to develop a unified digital system for assessing the North American biota. BONAP's database now includes assessment for all vascular plants and vertebrate animals (native, naturalized, and adventive) of North America north of Mexico, and it maintains the most current taxonomy, nomenclature, and biogeographic data for all members of the biota. The Synthesis of the North American Flora, published in 1999, is available for purchase as a CD-ROM (ordering information is provided); a 1mb demonstration version for Windows is available through the BONAP site. The Synthesis includes taxonomic, nomenclatural, and biogeographic data and images, enabling users to produce species checklists, distribution summaries, and species assessments for morphology, rarity, endemism, nativity, and other biological attributes. It consists of three parts: the "Lexicon," which provides the underlying nomenclature and taxonomy; the "Atlas," which displays distribution maps for each of the accepted taxa; and the "Biological Attributes," which provides summaries of morphological and other specialized data (rarity and endemism, nativity, weediness, habit, habitat, and others).